Influx wonders if multiple medias exist because human beings like to engage in a variety of different experiences; they like to read, listen and watch, sometimes all at once, but often independently. Print owners are betting the farm and reacting in a knee jerk way to the proliferation of online video. They see the attractive advertising rates and are jumping headlong into the fray. Creating video and writing a newspaper are two very different skill sets; simply arming your reporters with video isn’t going to be enough. Online video has some very appealing qualities, but unlike a newspaper, you can’t really scan it or browse. Most forwarding tools online are cumbersome at best. It usually means you are stuck in front of the screen waiting for the interesting stuff to happen. It’s not interactive, even though it lives on the web. Also, in this new world, there will also be an annoying ad somewhere in the experience, something that you can’t control. The big problem is the proliferation of content. There is going to be so much stuff created and not-enough eyeballs to watch it. Storage technology firm EMC recently reported that enough content was created in 2006 to fill 161 billion iPod shuffles, the firm predicts that by 2010, 70% of this content will be consumer created. Somewhere in all of this lies a war for attention, it’s not about the media, the content is the thing. While publishing houses may like to tell advertisers and their agencies that they offer advertising and sponsorship on their online videos, that maybe fine today, but if they don’t perform, there will be no value in them. In the growing mountain of content lies consumer-created stuff that will only get a few views; it could be a personal holiday video shared with family or friends or a video greeting card, the challenge is that all this will be compete with 10 million channels of big media content and there simply isn’t enough time in the day for people to look at all this stuff. 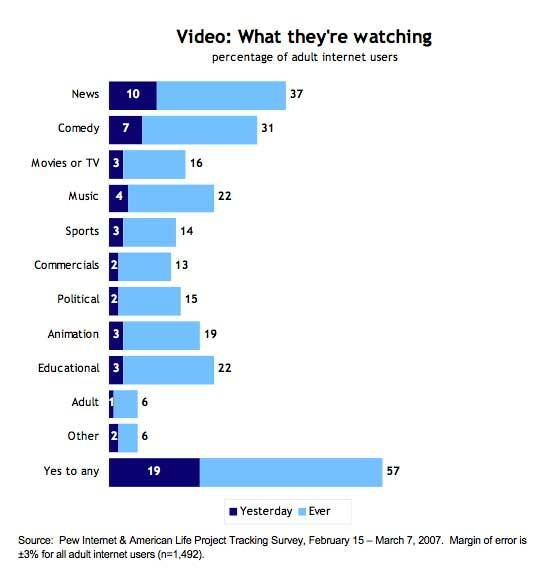 Perhaps the rush to online video is a big red herring, a false dawn before we work out the answer to the real question. Vanity Fair’s Graydon Carter hints at this in his piece for Good Magazine on the 51 Best Magazines Ever. What’s the new media that merges television and the internet together? The true interactivity of the web, with the emotional experience of television this may not have been invented yet, but before publishers leap headlong into the online video gold rush, perhaps they should talk to some experience designers about creating a truly digital newspaper or magazine- something that’s immersive, digital and interactive. If they can do this, they might just create something distinctive and unique enough for their readers to want to watch and interact with. What’s happening to your online plan?